Your parents and grandparents may have driven one of the most popular and reliable sedans when they were younger, but they never drove a car quite as attractive as this one. Over the years, the Honda Accord has been a name we know and trust and it’s one that offers us the ability to enjoy the drive and have the quality we’re looking for. After a major overhaul, the new 2018 version of the Accord looks great and offers the style and presence we’ve been looking for when it’s time to drive to and from work on a daily basis. 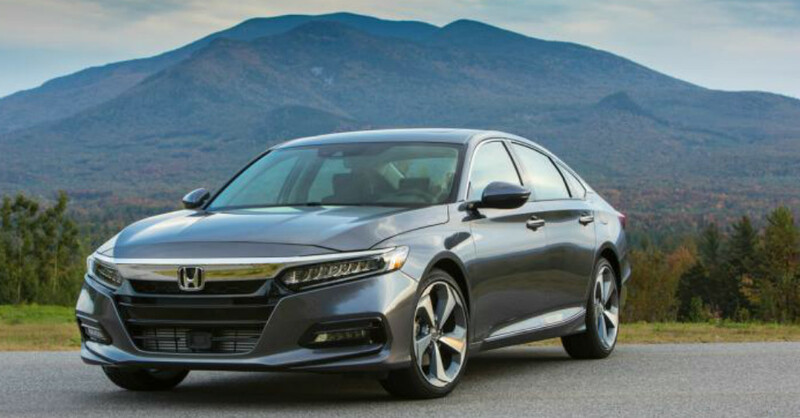 Not only is the new Honda Accord a vehicle that offers you the quality and the look you desire, this is a sedan that is a midsize model that has the safety features and the affordable price you want. These qualities make this car one that can offer you every aspect of the drive you want with the fuel efficiency you need to go along with the massive rear seat which is a comfortable place for your children or your carpool companions to ride along with you when you need to get to work or get things done. Redesigned from the ground up, the 2018 Honda Accord becomes a vehicle that is offered with a ton of new stuff while beginning a new generation for this car. There are two new turbocharged engines to choose from, the Honda Sensing safety technology is offered on every model, the Accord Touring model offers a new adaptive suspension with other trims bringing in upgraded infotainment and smartphone integration systems. There will also be a hybrid model of the Accord, but it won’t arrive at dealerships until the early part of the 2018 calendar year to become an excellent choice. The impressive new Honda Accord is offered in five different trims for you to choose from. These trims are LX, Sport, EX, EX-L, and Touring. At the LX trim you’re going to have the benefit of the Honda Sensing suite of safety items, push-button starting, dual-zone automatic climate controls, 17-inch alloy wheels, LED low beam headlights, a multi-view rear backup camera, a seven-inch display, Bluetooth connectivity, and automatic on/off headlights. The Sport trim provides you with an eight-inch display, Sport seats, Apple CarPlay, Android Auto, and a 12-way power driver’s seat for the drive you want. Continue to move up the trim levels and experience the EX trim which brings in blind-spot monitoring, rear cross traffic alerts, a power moonroof, a remote starter, heated front seats, and rear seat air vents. The EX-L offers you leather seats, a 450-watt audio system, and a four-way power passenger seat. The Touring trim gives you a navigation system, full LED headlights, a head-up display, wireless phone charging, HondaLink Assist, heated and ventilated seats, heated rear seats, rain sensing wipers, and parking sensors in both bumpers. The Hybrid models are expected to match the non-hybrid models with the exception of the lack of a Sport trim. There are three engines offered for the ride you want in the new Accord. The base engine is a 1.5-liter turbocharged four-cylinder model that brings in 192 horsepower and 192 lb.-ft. of torque. This engine can be attached to either a six-speed manual or CVT automatic transmission depending upon the trim and choices you make. The upgraded engine is the 2.0-liter turbocharged four-cylinder mode that increases the power to 252 horsepower and 273 lb.-ft. of torque for the drive. The third choice is the hybrid powertrain that will be offered in the early months of 2018 which adds an AC Synchronous Permanent Magnet Electric Motor to the 2.0-liter engine. Take a look at the new Honda Accord and choose a version of this midsize sedan that’s better looking, has more quality features, and offers you the driving experience you want on the roads when you choose this excellent vehicle. This Accord is much better than what your parents and grandparents drove when they chose their models and it offers you the comfort, the drive, and the efficiency you’re searching for. Come in and take a look at this excellent model at your nearby Honda dealership.